Port Loko — Fatmata Sesay was 15 years old when she became pregnant. Her parents forced her to move in with her boyfriend, who was neither in school nor employed. Moving in with him felt like an underage marriage, she says. "It was a situation I found difficult to accept," she said. "Seeing my peers attending school every morning was a bitter pill for me to swallow." And for the most vulnerable girls, gender-based violence is an ever-present threat. The Port Loko Police Station's Family Support Unit reported 272 cases of gender-based violence in 2017, almost half of them involving adolescents. The Girls' Access to Education and Services (GATES) programme, funded by Irish Aid and implemented with the Ministry of Basic Secondary School Education, aims to teach young people important life skills and to empower them with information about sexual and reproductive health. Additional training will also be provided to health care workers and people who support survivors of violence in Moyamba, Kailahun, Koinadugu, Port Loko, Pujehun and Tonkolili - the six districts with the highest rates of teenage pregnancy in Sierra Leone. In September, members of the girls' club at the Movement of Faith Islamic Secondary School in Port Loko visited Fatmata. They encouraged her to return to school and, with their guidance counsellor, helped her to reenrol. A few days later, Fatama joined the girls' club. "The good thing about the girls' club is that members are given the opportunity to speak about their experiences and share their aspirations," Fatmata said. "Since the implementation of the GATES project in 2018, about 80 out-of-school girls from the district have been identified and reintegrated back into the formal school system," he said. "Two community learning centres in the district also help prepare out-of-school girls to return to formal school." And the girls "are being referred for psychosocial support, family planning and other social welfare services," he added. These girls can become leaders and role models, Mr. Sesay said. They just need help realizing their potential. "Girls have the power to influence change in our society," he said. "I have now returned home to live with my parents," she said. 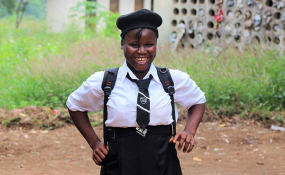 "I want to continue with my studies, as I dream of becoming a nurse." Copyright © 2019 United Nations Population Fund. All rights reserved. Distributed by AllAfrica Global Media (allAfrica.com). To contact the copyright holder directly for corrections — or for permission to republish or make other authorized use of this material, click here.